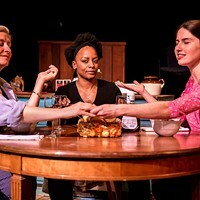 Review: Quill Theatre's "The Merchant of Venice" | Theater | Style Weekly - Richmond, VA local news, arts, and events. Review: Quill Theatre's "The Merchant of Venice"
Matthew Radford Davies as Shylock in Quill Theatre's production. Two of Shakespeare’s plays always have given me moral conundrums. For all of its charm and witty dialogue, it’s hard to get around the takeaway from “The Taming of the Shrew” is that women should defer to men -- that after Kate marries Petruchio she tells the other wives to “place your hands below your husband’s foot” in submission. Similarly, I’ve always had a problem with anti-Semitism in “The Merchant of Venice,” the tale of a Jewish moneylender who would rather cut a pound of flesh out of a rival than receive a huge financial payday. Set in 16th-century Venice, the titular merchant is Antonio (Iman Shabazz), a melancholy man whose friend Bassanio (Joseph Bromfield) needs money to woo the wealthy Portia (Addie Barnhart). 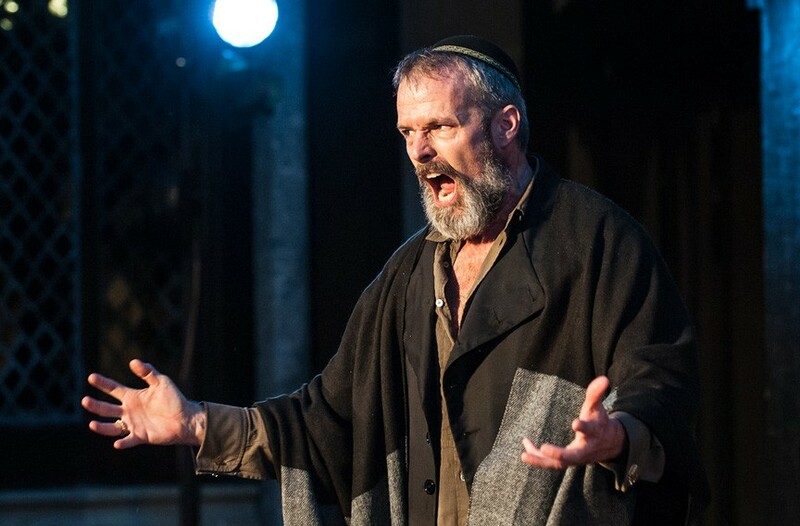 With all of his ships at sea, Antonio is cash-poor, but he makes a deal with Shylock (Matthew Radford Davies), a Jewish man who is despised by many, including Antonio. Shylock agrees to lend the money without interest on the condition that he may cut a pound of Antonio’s flesh if he defaults on the loan. Under Jan Powell’s direction it’s difficult to imagine a more masterful or sympathetic depiction of Shylock than Davies’ portrayal. He’s a captivating presence on the stage, his every move carefully calculated. You feel the weight of his persecution, and how it has warped him to wickedness. His “Hath not a Jew eyes?” speech is particularly moving. 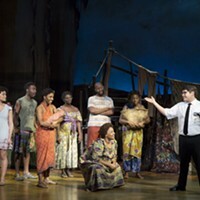 The play’s other main storyline involves Portia and her quest to find a suitor. Her deceased father stipulated in his will that her suitors would have to pick between three caskets -- one of gold, one silver and one lead -- from which they must choose, Goldilocks-style. The winning casket holds a portrait of Portia; the others hold scrolls that mock her suitors. 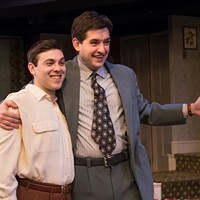 Here, Barnhart excels with some of show’s wittiest moments, dispatching a couple of oddball suitors, including an uproariously over-the-top Luke Schares as Arragon. Elsewhere in the show, the broader, slapstick humor often falls flat. But Powell and company do particularly well with the classic courtroom scene, in which Portia, dressed as a male lawyer, rules in Antonio’s favor against Shylock. 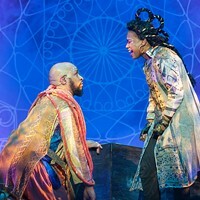 Devario Simmons’ intentionally scattershot costumes -- which mix traditional Shakespeare garb, Converse sneakers, plaid shirts and baggy pants -- speak to no particular time period, and might better be suited to one of Shakespeare’s more traditional comedies. Overall, the show works, but it’s still hard to get over how unsettlingly anti-Semitic the play is. And the connections Powell seems to be drawing to America’s current era of police shootings, terrorism and unrest only carry over in that they share the same themes. While perhaps Shylock was intended as more of a comic figure than a villain or sympathetic character in Shakespeare’s day, it was also written by a man who probably only knew about Jewish people through hearsay. From 1290 -- the year of King Edward I’s Edict of Expulsion -- to 40 years after Shakespeare’s death in 1616, Jewish people weren’t allowed in England. Shylock is written as a stereotypically greedy character. When his daughter runs off to elope with a Christian with part of his fortune he is said to grieve alternately for “My daughter! O my ducats! O my daughter!” Because the play closes with the Christian characters celebrating and in love, no matter how sympathetic a Shylock we’re given, at the end we’re ultimately partying with his oppressors. Shylock has been stripped of half his money and property, and been forced to become a Christian, destroying his identity. In a way, it’s like those old horror movies where you sympathize a bit with the monster. But Shylock isn’t the Creature from the Black Lagoon -- he’s a member of a tribe of people who have been persecuted seemingly for as long as they’ve existed. Quill Theatre’s “The Merchant of Venice” plays through July 31 at Agecroft Hall, 4305 Sulgrave Road. 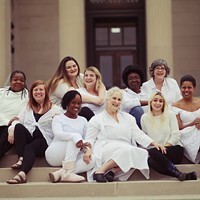 Visit quilltheatre.org or call 340-0115.